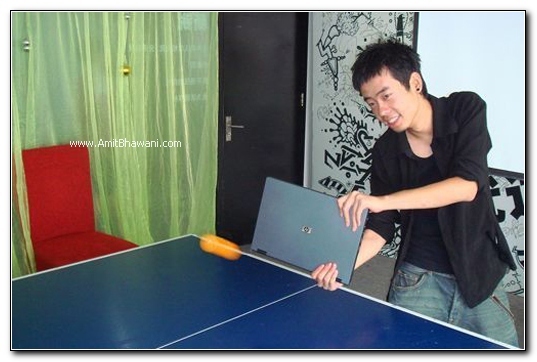 Because table tennis is supposed to be fun! Got something to add? Send it to us! 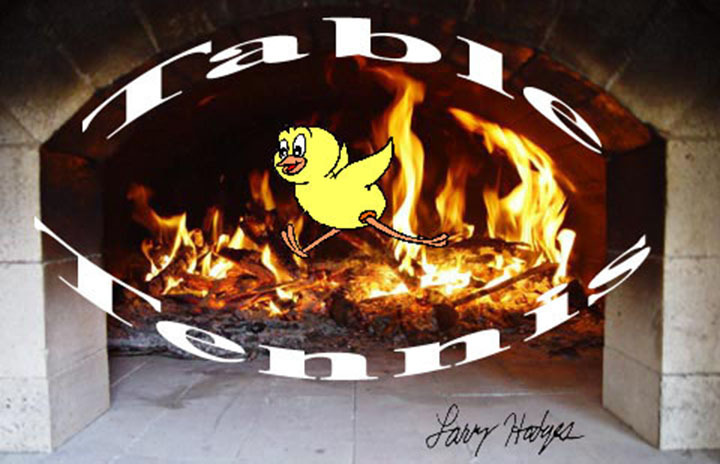 MENU- click below to find these sections! 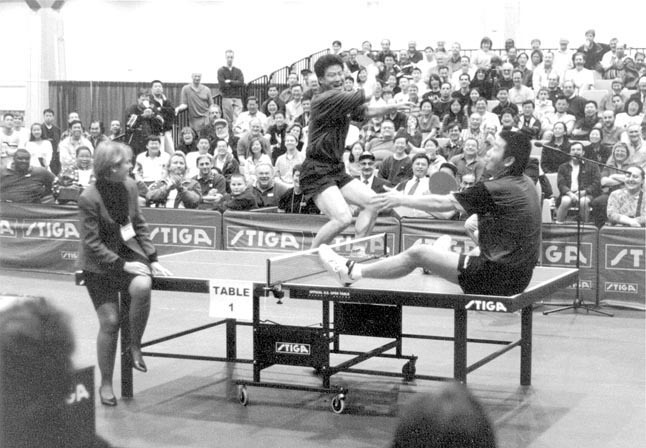 Over 1200 pictures of over 700 celebrities playing table tennis! 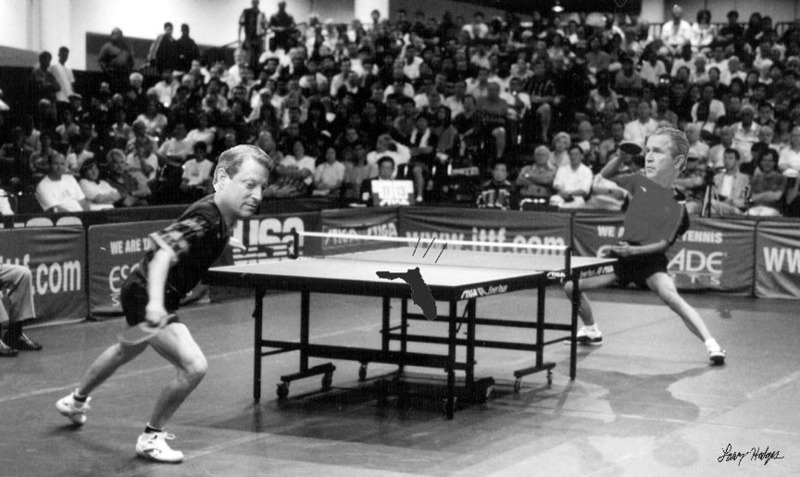 In a moment of sudden clarity, I realized what this world needed was a web page devoted to pictures of celebrities playing table tennis. Ninja twins playing with nunchucks, karate kicks, and multible balls (2:11). Lady playing table tennis in bed, using hands and feet to play herself! 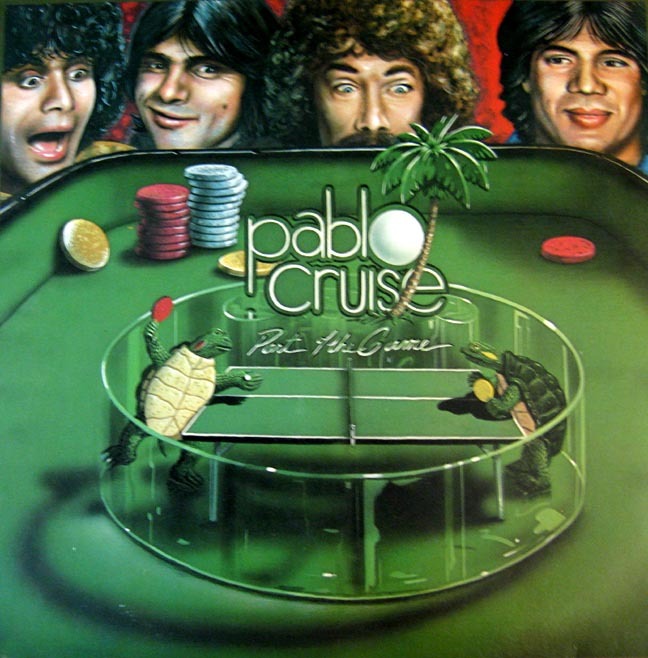 Recording of Captain Jean-Luc Picard (from Star Trek, but in an episode of The Simpsons) saying, "Now let's all get drunk and play ping-pong!" Rallying with a live grenade (3:34). Warning - gory ending! Baron Davis of the Cleveland Cavaliers takes up table tennis (humorously) as he promotes the Topspin Charity Ping-Pong Tournament. 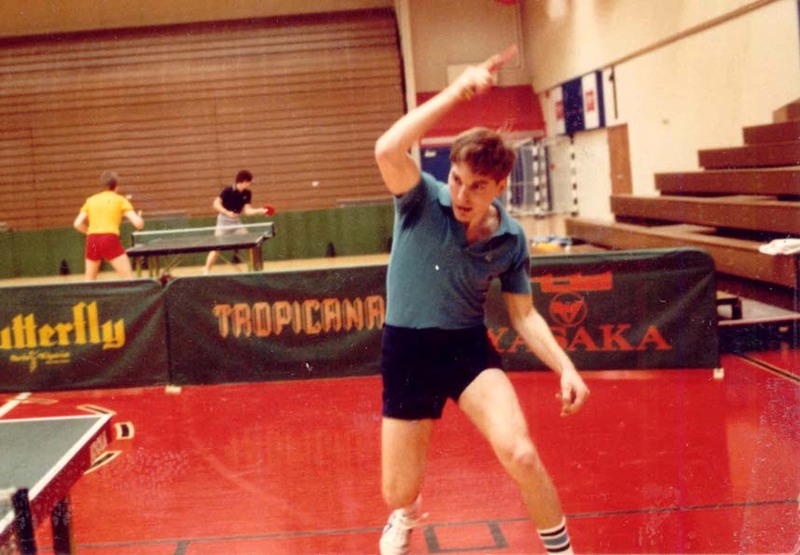 Here's two minutes of Adam Bobrow, mostly from movie and TV roles, including three table tennis scenes. Beer Pong - some of these shots are pretty incredible! There are so many videos of these that I'm just going to give a sampling. Dogs on the Table. Lots of net jumping! 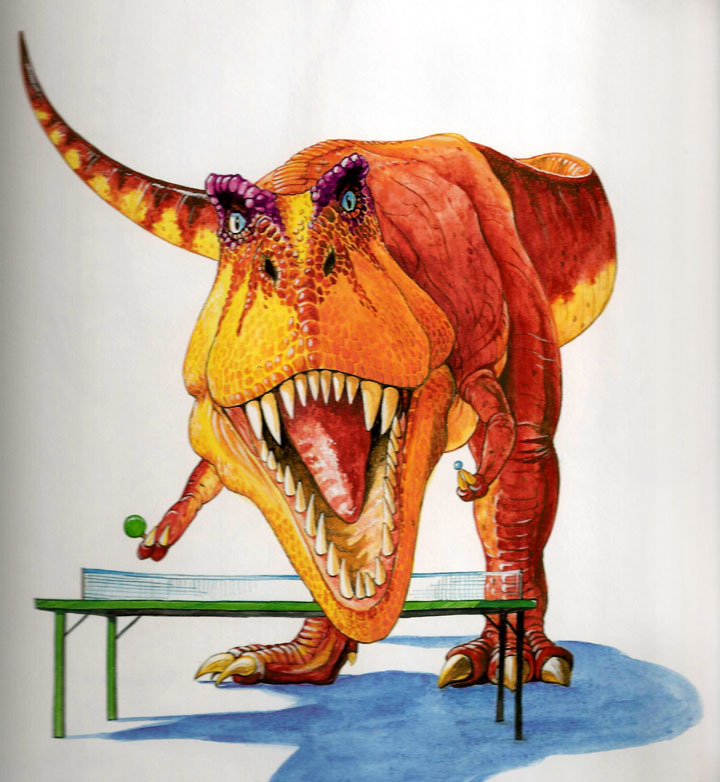 The table tennis cartoons of Marek Zochowski, published in USA Table Tennis Magazine. 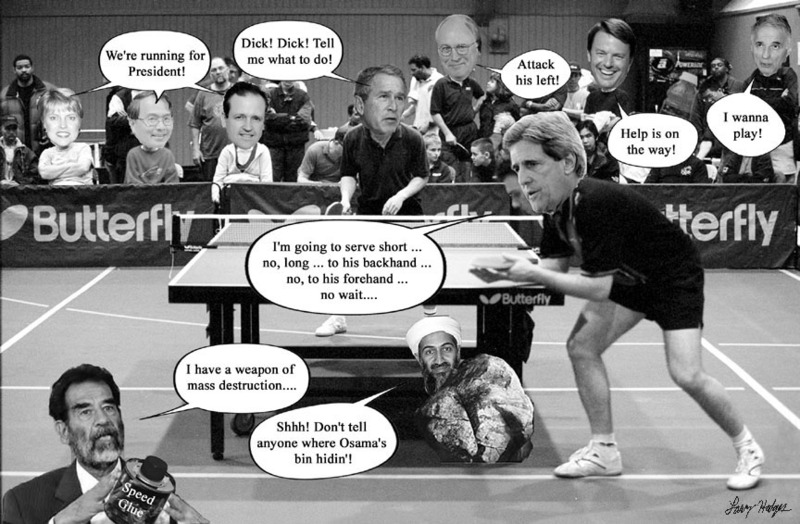 The table tennis cartoons of cartoonjazz.com, published in USA Table Tennis Magazine. 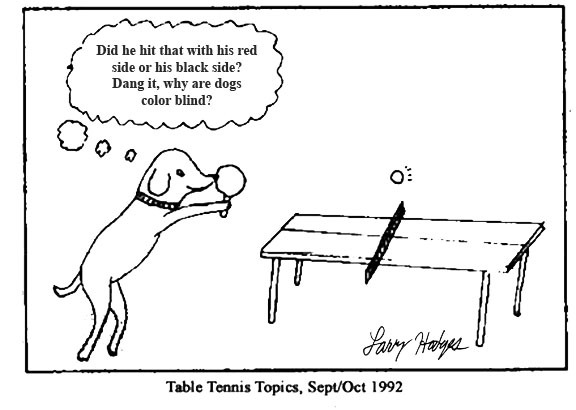 Why dogs don't like combination rackets. 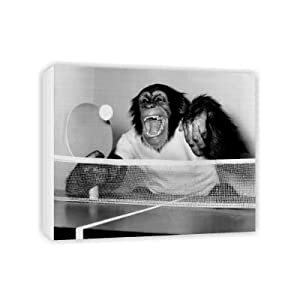 Did table tennis players evolve from apes? 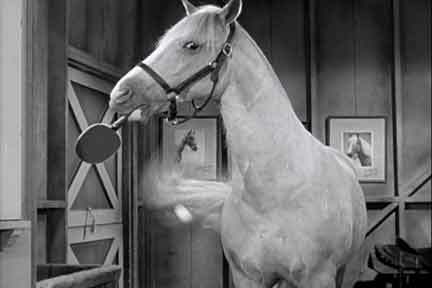 W.C. Fields ... playing ping-pong? Patrick Gheorghe ... on top of things? 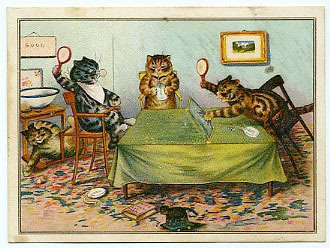 Is it triples if two of the players are cats? Former World Women's Champion Zhang Yining has an interesting nose. Kid with big red ears and big orange eyes. 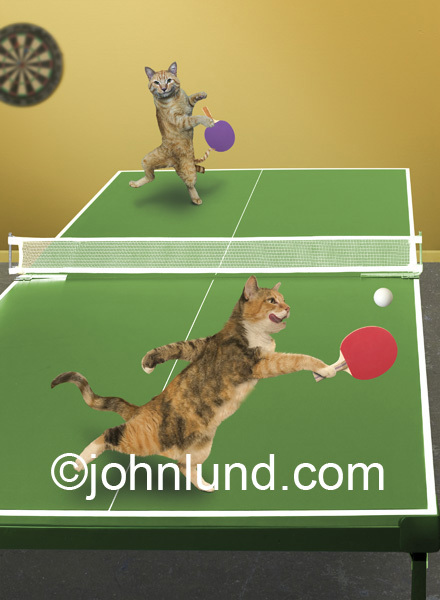 Promotional poster from movie "Balls of Fury"
Here are six table tennis pictures: What society thinks you do, what my friends think you do, what Asians think you do, what Americans think you do, what you think you do, and what you really do. The glass ping-pong table of Ellen DeGeneres. 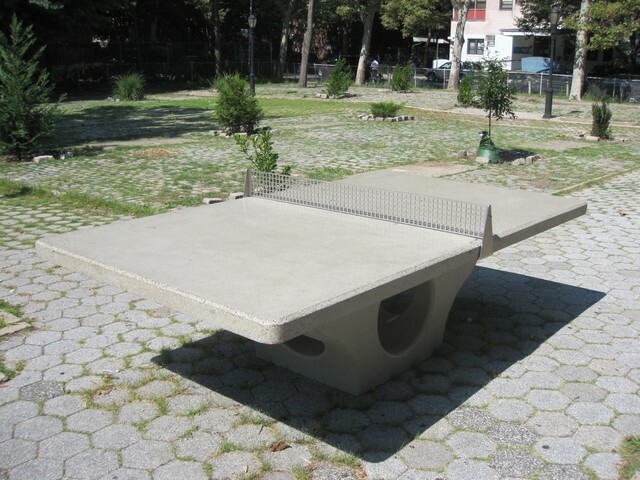 Cylindrical table tennis. 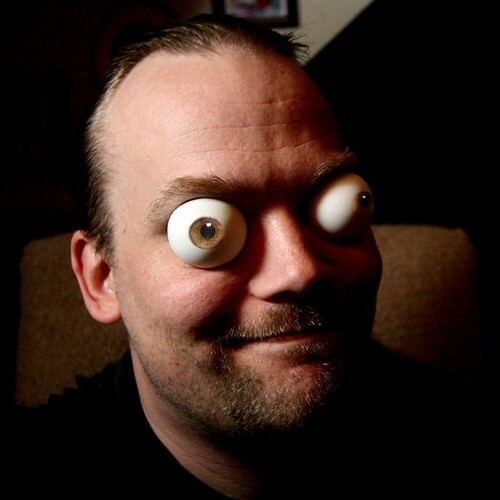 I think it rolls while you play. 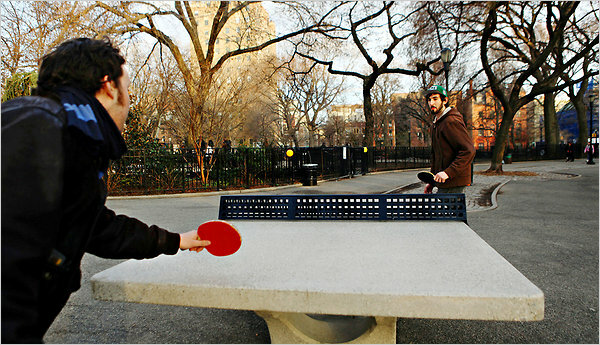 Three-way circular table tennis. But yellow surface and pink legs? 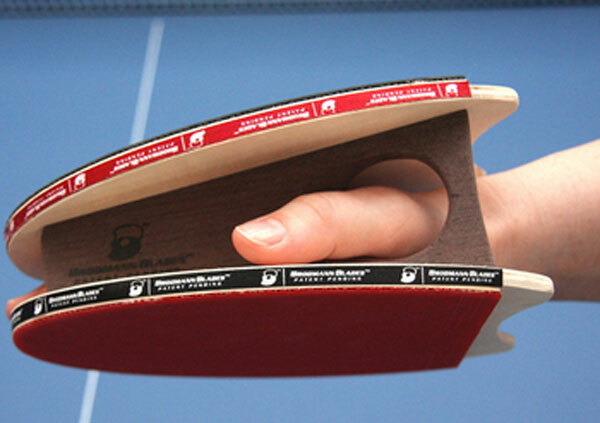 Four-way octagonal table tennis. 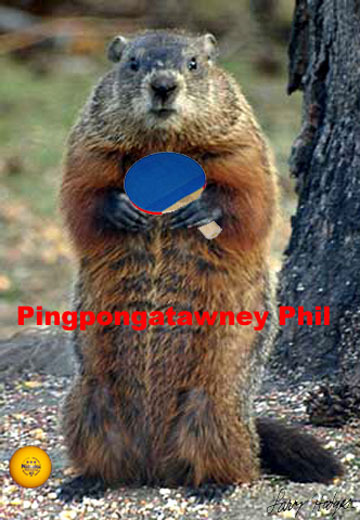 Yes, let's go play polypong! 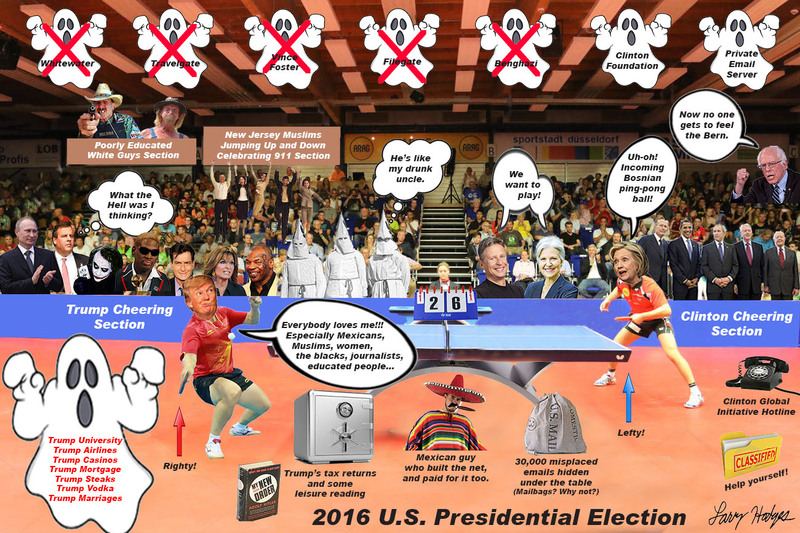 Harry Potter Ping-Pong Week - The Truth about Harry Potter and Ping-Pong will shock the wizarding and muggle worlds, as told by He Who Shall Not Be Named, alias Dark Lord Marty Reisman and his elicit hardbat wand. 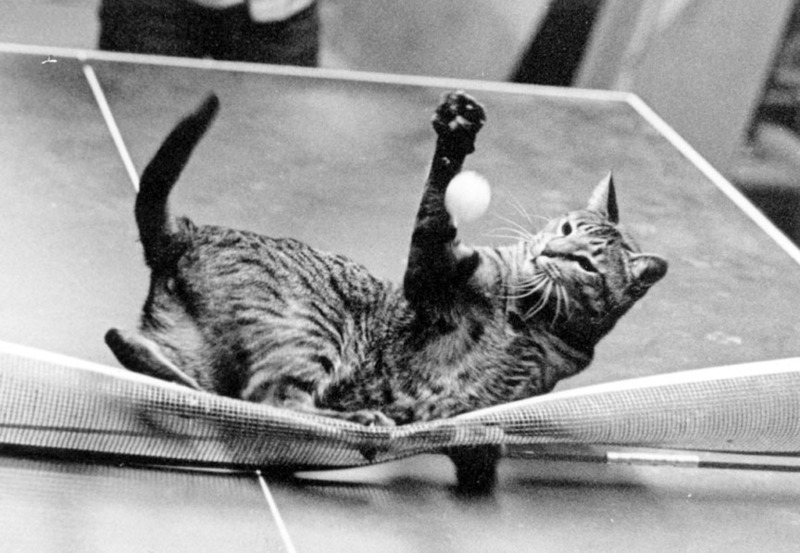 The rules of table tennis ... before you knew the real rules! 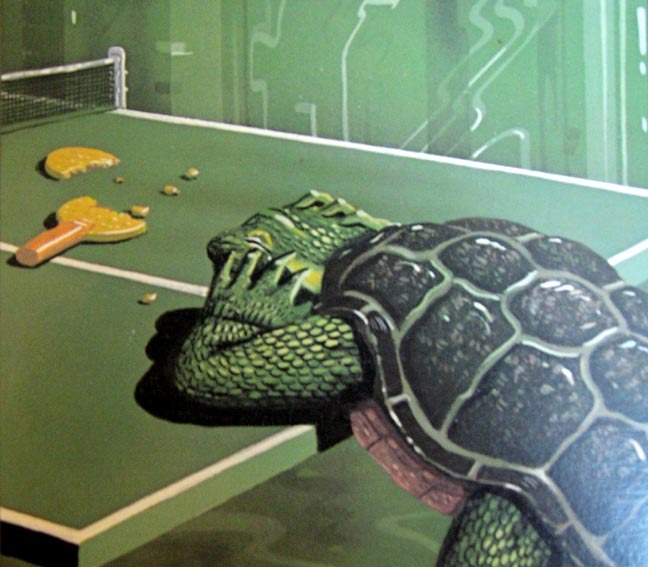 Chapters 15 & 16 from Piers Anthony's "Robot Adept" - about a table tennis match between the champion from a world of science (with a scientific racket) versus the champion from a world of magic (with a magic racket). Classic Pong! For one or two players. 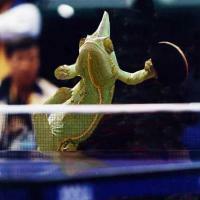 FOT 3-DTable Tennis Game - starts with a Geico commercial, alas. 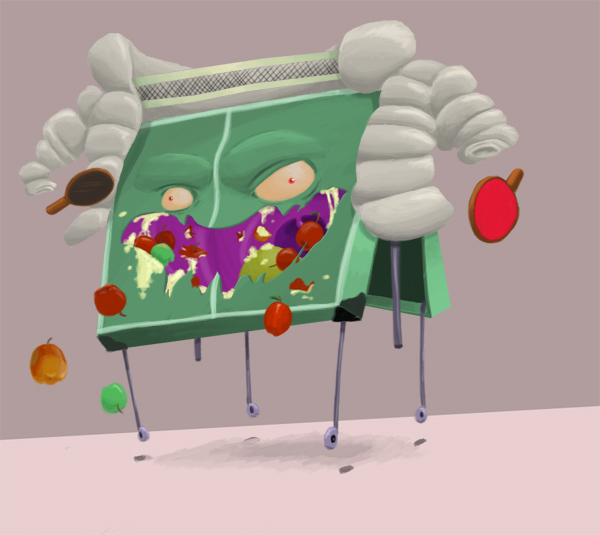 Free Online Games Virtual Ping Pong Puzzle (starts with a 15-second commercial, alas).